Hungarian paprika is a striking bright red colour with a mild sweet flavour, although hotter grades are available. Spanish smoked paprika is not so brightly coloured, and has a distinctive smoky aroma – like a hide of leather stretched out in the sun to dry, mingled with charred chillies and cigar box – and it has a more complex flavour. It comes in sweet, bittersweet and hot strengths. I use sweet paprika as a sprinkle or when I want a more subtle hit of paprika, and hot paprika in cooked dishes and in Spanish dishes. Paprika is high in vitamin C and other nutrients. It is light-sensitive, so store it in a pantry away from light. 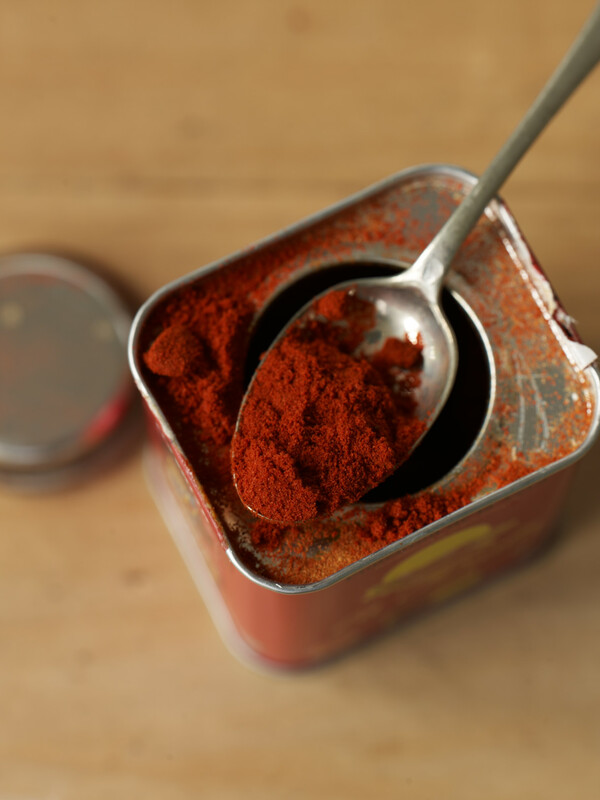 Smoked Spanish paprika is sold in small tins; don’t transfer it to a glass spice jar as its colour will quickly fade. Leave it in the tin and keep it airtight in the pantry where it will last for many months. La Chinata smoked Spanish paprika, the world’s first spice to receive DOC status, (it is not irradiated), is made with three varieties of pimento which are slowly smoked over a low flame. Available in sweet, bitter-sweet and hot.